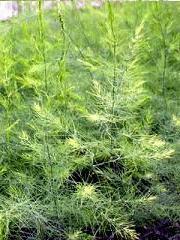 To make the young shoot for food as a vegetable with the perennial plant, asparagus is grown. It belongs to liliaceous or the [kusasugikazura] department and the dioecism. The one that looks like the leaf is a stalk that branches in detail, and an original leaf has degenerated like the squama. There are a lot of nutrients in asparagus, and vitamin A, vitamin B1, vitamin B2, vitamin C, vitamin E, the leaf acid, the aspartic acid, and Colin and the saponin, etc. are contained. The folic acid in this is assumed to be effective in the prevention of anemia in the element related to cell growth. Moreover, the aspartic acid of the companion of the amino acid is the effect of urging the renewal and removes the tiredness material. There is a diuretic action as other medicinal effects. The sickness etc. infuse and drink the one of the bladder and the kidney that the rhizome was dried. It is said it is effective also in the parasite removal. Constipation is prevented to the whole because the dietary fiber is abundant even if it doesn't eat parts that stripes especially and are a lot of as an effect of beauty and there is an excellent effect of beautiful skin. It is stocky, and the one that green is thick and short is soft and it is nutritious to the whole. I think that the ear tip is not open, and the one with a fresh cut of the root is good. It cannot eat the too long one in the root part because there are a lot of fibers. As the cooking method, it boils, it stir-fries in oil, and it burns. It is possible to eat and to make it to the salad by cooling after it boils it and putting up the mayonnaise. Eat the fiber as much as possible though the part in the root of asparagus might be cut a little and be thrown away because there are a lot of fibers. Eat all the parts of the skin because there is a lot of nourishment. This photograph grows asparagus. The one that looks like the leaf is a stalk that branches in detail. 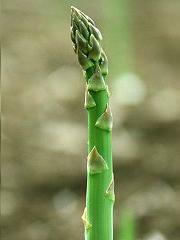 After it applies it of planting, it is possible to harvest for years how many because asparagus is a perennial. It is easy to buy the seedling though there is a method that raises from the seed, too. To enlarge the stock without harvesting at least one year, it raises it. After the seedling is planted, a real harvest is done during year third. The bud grows up in April - June, and when it expands, a soft stalk is caught and length assumes for food to about 30cm. Asparagus is strong vitality and grows several cm a day. Several asparagus is left without catching. It ..about 1.5m in height.. grows. The stalk that looks like the leaf is made to grow thick, it is made to carry out photosynthesis, and the nutrient is made to be saved in the root. When winter comes, this is reaped because the above-ground part withers. Asparagus is a dioecism. It is difficult to distinguish victory or defeat though the male plant is a lot of amount and is said to the sickness that it can harvest the one of a strong, moderate thickness until the flower blooms. The white asparagus is the one (shading by covering with the soil, and using the abolition tunnel and cultivation). It is said green asparagus, and here is more nutritious to green what usually raised. Because about as many as 1-2m in depth expands as for the root of asparagus, it cultivates as deeply as possible by using the heavy equipment of the backhoe etc. if possible and drain is improved. Moreover, it becomes empty a lot in the cultivated land all layers and it crowds as much as possible compost, the foul dung, and the organism of the cowcake etc.It digs up the culvert when drain is bad or it makes it to a high ridge. Asparagus makes it scatter slaked lime and neutralize because it is weak to acidity. At this time, it is important not to do slaked lime with the nitrogenous manure. The ammonia gas is generated if slaked lime and the nitrogenous manure are scattered together, and the effect of the nitrogenous manure disappears. Freshness and the taste can be maintained by preventing, setting up the wrapping dryness with wet newspaper etc. , and preserving it with the refrigerator. Because it is early that freshness falls in the life, you may quickly boil to hardening, multiply the lap, and cryopreserve it.